I never would have pegged Sacramento as a potential place to achieve Dead Head nirvana. The capital of California (complete with classic, domed State building), it sits in the heart of the state's hot, dry and flat northern Central Valley, about eighty miles northeast of San Francisco; on the way to Tahoe, on the way to points north and south on Interstate 5. But it's the biggest city in the Valley and also a natural locus for excursions to other parts of the state, so the Grateful Dead played there fairly regularly, beginning in 1966. In the late '60s and early '70s, they mostly played at the 4,000-seat Sacramento Memorial Auditorium, a relatively cozy civic hall built in 1927--and rarely filled it. (Hard to believe, ain't it?) There was a six-year gap between '72 and '78 when the band did not play Sacramento, then another five-year break between shows there from 1980 and 1984 (though during each fallow period, the band played once nearby at U.C. Davis). Sacramento became a more favored spot on the Dead's itinerary in the mid-'80s, once a lovely 12,000-seat amphitheatre was built on the Cal Expo state fairgrounds right outside of downtown. The fairgrounds had hosted the California State Fair--with its livestock exhibits, pie-baking contests and assorted family-friendly activities--since 1968, and indeed the Grateful Dead first played the fairgrounds the following year, headlining a "birthday" show for Sacramento radio station KZAP in "Building A" there on November 21, 1969. That venue was pretty much just a square-box exhibition hall, but Cal Expo Amphitheatre, built in the early-'80s, was like a true oasis, with a large grass field, bleachers in the rear and excellent sightlines and good sound for all. 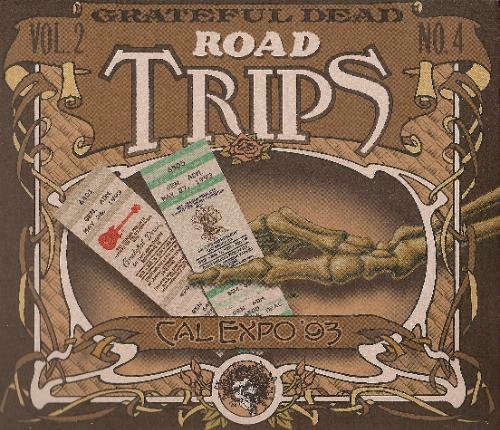 It might not have had the cachet of other California venues the Dead started playing often during early '80s, such as the Greek Theater in Berkeley, Frost Amphitheatre in Palo Alto, the Ventura County Fairgrounds, or even Irvine Meadows in Orange County, but most of the Dead Heads who made the trek to Cal Expo when the Dead first played there in June 1984, came away mightily impressed--despite the oppressive afternoon heat and only so-so shows. Those factors might have served to hold down the crowds when the band returned for a pair of rip-roaring concerts there in May 1986, This time the weather was beautiful, and who can forget the sight of a giant Mr. Potato Head balloon rising from backstage during the second set-opening "Gimme Some Lovin'"? Well, the reputation of that weekend was all it took to make Cal Expo a don't-miss destination for Dead Heads when, in 1989, the band inaugurated what would become six consecutive years of three-show runs at the venue (and two three-show runs in 1991). Every show sold out in advance and Dead Heads from all over packed hotels and campgrounds in the area. Playing in the evening (usually) kept the temperatures down--okay, the wait outside the gates in the mid-afternoon could still be pretty brutal, but there was even relief for that: right next door was the Water World theme park, with fabulous twisty water slides and cool lagoons. You could even see into the amphitheatre from the top of the taller water slides. All things considered, Dead Heads lucked out with the weather most years at Cal Expo--I remember cool breezes bringing relief as first sets ended, and many a beautiful sunset there, particularly the years the Dead played there in May. The parking lot scene was dusty but spirited, and it grew larger each year the Dead played there, for better and worse. Which brings us to May 1993. Once those of us who lived in Northern California "lost" the Greek and Frost after 1989--the direct result of an over-population of ticketless hordes outside of both venues--Cal Expo became the last great place to see shows locally. Unlike the somewhat sterile new "shed" in the Bay Area, Shoreline Amphitheatre, Cal Expo remained all-general admission, so you could dance with your friends, and it always had that beautiful green grass that was so inviting and cool to the bare foot. At a time when the Dead were regularly playing stadiums in the east, Cal Expo felt positively small and intimate (even after the capacity was increased slightly). It became my favorite place to see shows. Evidently the Dead understood how special the place had become in the hearts of many Dead Heads, too: From 1990-94, these de facto hometown shows were benefits for their good-vibes philanthropic wing, the Rex Foundation. It helped, too, that the band nearly always played really well there. When we gathered there May 25-27, 1993, many of us still held fond memories of the '92 Cal Expo shows, with the debut of the band's dynamite covers of "Baba O'Riley" and "Tomorrow Never Knows," and a killer "Gloria" encore the third night. The '93 Cal Expo run was a midweek series, following consecutive weekends at the Silver Bowl in Las Vegas (where Sting opened for the Dead) and at Shoreline, so the band was definitely primed and ready to rock. The 5/25 show started off with a generous nine-song first set, and featured a rare second-set-opening "Eyes of the World," and an encore of "Rain." Cool. But that show practically felt like a warm-up once the band had kicked into gear on 5/26, which is where we pick up this edition of Road Trips. Starting with an unusual first set opener, "Samson and Delilah," followed by the band's harmony-heavy arrangement--courtesy of "new guy" keyboardist Vince Welnick--of "Here Comes Sunshine" (always a treat in the literal sunshine), it's obvious the band is onto something special this day. The second set, presented virtually in its entirety here, is truly amazing, as it moves from a feel-good "Box of Rain," to the gnarly dissonance of "Victim Or The Crime," the lilting bounce of the always-welcome "Crazy Fingers," and then a brilliant, exploratory "Playing In The Band" that goes on for more than 18 minutes of often intense jamming before the guitarists surrender the stage to Mickey and Billy. These are the types of "Drums" and "Space" jams that really appear to be tied organically to the song that precedes them, so it feels as if there are hints back at the "Playing" jams all through this adventurous freeform segment, even as it presents a classic drum duel, a hair-raising section that sounds like psychedelic gamelan music, passages where Garcia plays with his distorting pitch-bend petal and with pristine MIDI "trumpet" tones, and all sorts of other rhythmic and melodic weirdness. Somehow, when the still-newish "Corrina" comes clinking out of this long, circuitous "Space," it feels almost like a momentary diversion off the true path, and we just know the "Playing" reprise is still lurking nearby--if ever a "Playing" cried out to be finished it's this one, and the band finally gathers itself together and brings it home for a tremendously satisfying conclusion. That then settles easily into a deeply moving "China Doll" (great solo and coda by Jerry! ), before Bob pulls the set to a close with a rockin' "Around and Around"--check out Weir playing MIDI horn parts on the big build-up in the middle jam! The encore is a spirited take on another new song of that era: "Liberty," a rhythmically compatible bookend to the opening "Samson," and always a cheery number to end with. The remainder of Disc Two highlights a fun selection of tunes performed during the first set of the 5/27 show, including excellent versions of "Shakedown Street" and "High Time," among others. There are a number of Dead Heads who point to the wondrously adventurous 5/26/93 second set as a sort of "last hurrah" for the Grateful Dead--they see in the long arc of the group's history a decline in the second half of 1993 and beyond. I don't see it quite so dramatically--I think there were still many more outstanding shows to come in '93, and while there is certainly a dramatic downturn in 1994, as Garcia's health became an issue that could not be ignored, there are also gems to be found there, especially in the fall of that year; and even 1995 has a few solid shows. But I believe it is fair to say that this run of shows in Sacramento represents a peak of the latter-day Dead--with everyone playing at top form and with enthusiasm before a crowd of "family" and friends in one of the coolest venues around. At the time, it truly felt like it couldn't get much better than this. And in retrospect, sadly, that turned out to be true. The Dead would play one more, largely forgettable, series at Cal Expo, and the venue itself was torn down in the winter of 1997-98 after many years of battles over noise from the neighborhoods that spring up in the vicinity through the years--"wherever we go, the people all complain." Bill Graham Presents/SFX (now Live Nation) built a new, larger amphitheatre 65 miles north in Marysville, and folks seem to like it fine, but it's definitely not the same, obviously. The State Fair still takes place elsewhere on the 350-acre Cal Expo site, usually at the end of August into early September, and I suppose it's a fine place to see the likes of M.C. Hammer, former Foreigner lead singer Lou Gramm and a Beatles tribute group call the Fab Four (to name three acts scheduled to play at the 2009 fair). But I remember a time when my friends and I danced barefoot and blissful in the sunshine to our favorite band at Cal Expo and the "real" world felt very, very far away. This album was released in August 2009.